April showers bring May flowers. The old saying is true. April is full of rain, but there’s no reason you can’t have flowers before May. During rainstorms, water gushes out of downspouts, across lawns and gardens. It has a tendency to accumulate in one place and can overwater or even flood a garden. Excessive rain saturates soil, suffocates roots, breaks plants and attracts pests. However, when you’ve strategically planted for rain, gushing downspouts are no longer a problem. A rain garden is a garden that uses water-loving plants, with strong roots. It helps use rain where it lands instead of letting it run-off into streams, lakes and rivers. Measure out at least 10 feet from your home. Keep your new garden away from septic systems. Find somewhere with a natural downgrade, away from the house, if possible. If your garden is level, then find a place where soil is already absorbing water easily. Stay away from soil that holds moisture for an extended period of time. Measure the size and shape of the area. Once you determine what you are working with, you can begin planning what to plant. Plan out what looks best to the eye first, while keeping in mind the plants that do best with wet feet should be in the middle. Since each region gets a different amount of rainfall, native plants tend to do best. You will want plants that do well in wet and dry conditions. Rainfall will add up occasionally over the year, but the soil can dry out in the warmer months. Choose plants that don’t mind having wet roots for extended periods of time such as blue fescue grass, daylilies, elderberry and tupelo trees. Look for water-resistant natives such as black chokeberry, meadowsweet shrubs, Joe-Pye weed, Colorado blue spruce, bayberry, ferns and winterberry. Check out your local garden center for tips on the best plants for your region. As all gardeners know, it starts with the soil. Good drainage is key to prevent water from sitting. If your soil needs a fresh start, or to be amended, add Espoma’s Garden Soil to help set your rain garden up for success. Further improve drainage by using pervious surfaces, edging puddles and creating paths through low-lying areas with sand or stones. It’s time to plant! Get your plants in the ground and watered in to stabilize them. Water every other day for two weeks to get it ready for a heavy rainfall and watch your garden grow! Planning your garden will keep your garden running smoothly. Prefer a vegetable garden? Here’s how to plan. Spring has arrived! Nothing beats walking outdoors to the sunshine and a beautiful landscape. Now is the time to give your lawn and landscape the TLC it needs. After winter, plants might be in rough shape. Don’t worry, your garden will be back up and running in no time! From weeding to fertilizing, there’s always something to do when spring rolls around. When updating your landscape, there may be a few things you need to pick up. Head to your local garden center to find everything you need. Trim back trees or shrubs that need a little push. It’s best to do this early, before new shoots start to come in. Be sure to carefully remove branches and flowers that have been damaged by the winter storms. You don’t want the branch doing more damage later on. Prepare your soil for new growth and new plantings. Sometimes that means getting all new soil like Espoma’s Organic Garden Soil or it could mean freshening up the soil you have by adding Espoma’s Organic Bio-Tone Starter Plus. Evaluate your garden. Take the mature size of your plants into account. What holes do you have? If any of your plants need to be caged or staked, planning now will allow you to plant around it without disturbing your growing seedlings later on. Plus it will set top heavy plants up for success, especially tomatoes, which bend easily. Rain, wind and snow can wreak havoc on your landscape. When the ground is wet and people walk through it can even cause compaction, which makes for poor growing conditions. But with a little love it will be ready to host your gorgeous garden once again. After planting, provide beds with a fresh layer of mulch. Mulching is the perfect way to get your garden off to a great start. Not only does it help settle in the roots, but it will provide warmth, hold in moisture, suppress weeds, encourage growth, and make your beds look all around beautiful. Not quite ready to get in the garden? Learn how to fertilize Houseplants with Homestead Brooklyn! The gardener’s itch has really set in! It’s only days until those beautiful and bright spring flowers pop up. Now is the perfect time to start making a list and planning what to plant. Start browsing magazines and blogs and coming up with all your favorite plants now. Narrow down your choices so you are ready to pick the moment you enter the garden center. As the soil starts to warm up, give your new flowers a head start with Espoma’s Flower-Tone for bigger, brighter blooms. When choosing, be sure to look at the plant tag or the back of the seed packet for specific information. Pick up your favorites at your local garden center. These flowers carpet any area you put them in. They spill into open areas, filling cracks and crevices with their tiny green leaves. Plant in between rocks, on a wall, or en masse to really make a show stopping display. The flowers come in pastel pink, lavender and white. They love being anywhere from sun to shade. They can grow up to 6” tall and 24”wide in zones 3-9. One of the best perennial flowers to plant in spring, these little white flowers hold strong all season. This plant is called bloodroot for the reddish rhizome and bright orange sap that grows at or below the soil’s surface. They love the shade and thrive in moist soil. They can grow up to 12” tall and grow well in zones 3-9. Go big with the oakleaf hydrangea. Its big flowers and oversized foliage will take your garden into spring with full force. It grows vigorously, all while providing a show stopping beauty. They love to be planted in partial shade. They can grow up to 6’ tall and 8’ wide in zones 5-9. Primrose is a unique spring flower, as they look best in clumps. Keeping them close together allows the beauty of the buttery yellow or white florals to really stand out. They love to be anywhere from full sun to partial shade. They can grow up to 12” tall in zones 3-9. Looking for a fun way to add color to your space? Try hanging baskets! Enjoying fresh air, sunshine and beautiful containers filled with spring blooms is a sure sign warmer days are on their way. Adding a spring container is an easy way to refresh your porch, patio or outdoor area. Get started by finding the perfect planter. Once nighttime temperatures remain above freezing, not dipping below, 30°F, you’re reading to plant. Before planting, check to make sure the container has drainage holes at the bottom. When you’re ready to plant, use Espoma’s organic potting mix to fill the container and then mixing in Espoma’s Bio-tone Starter Plus with the soil to give it that extra oomph. Remember to use a “thriller, filler and spiller” when planting new pots. Put the tallest growing plant in the middle, or at the back. Surround it with smaller plants and finally, those that spill over the edge. Combine any of the below plants for a look that pops! There’s still a way to get those beautiful tulip and daffodil blooms even if you didn’t plant them in the fall. Just stop by your local garden center to pick up already-blooming bulbs place them into your container for an instant pick me up. Choose plants that do double duty. Plant a mix of greens including spinach, kale, red and green lettuce and more. A container filled with spring greens will provide healthy salads while also brightening up the landscape. Add in viola blooms for a fun touch of color and don’t forget that herbs will help to create texture. Use Espoma’s liquid Grow! to give plants a healthy dose of nutrients. Summer is finally here! And we can’t wait to spend more time outdoors enjoying Mother Nature. What better way to get in some quality time outdoors than by prepping your garden for the exciting growing season that lies ahead. Check these five simple tasks off your list and prepare to have a picture perfect summer garden in no time. In a short time, you’ll finally start feeling the heat – and so will your plants. As temps increase, be sure to keep an eye on your plants and ensure they’re getting exactly the right amount of water. If you live in an especially hot climate or simply can’t keep up with watering by hand, invest in some sprinklers or an irrigation system. If you haven’t already transferred your indoor seedlings, now is the time. You can also start planting those heat-loving veggies, like tomatoes, squash, eggplant and peppers. Tidying up your garden gives you a fresh start for the growing season ahead. Prune plants to encourage healthy growth. Weeds are very persistent, so you should be too. A little bit of weeding here and there will prevent your garden from becoming overrun with invasive weeds. Bees and butterflies play an extremely important role in the garden and their pollination provides us with many of our favorite foods. 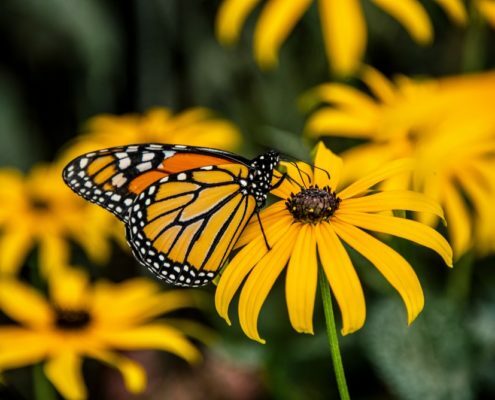 Create a pollinator friendly garden with a variety of native plants. And don’t forget to celebrate National Pollinator Week June 19-25! Nothing says summer like the sight of a lush, green lawn. While maintaining a healthy lawn may seem challenging, it’s definitely possible with a little bit of work. With kids and pets playing in the yard all summer long, you’ll want to make sure to stay safe. Choose Espoma’s Organic Lawn Foods for a beautiful green lawn that is safe for the whole family – and the environment.